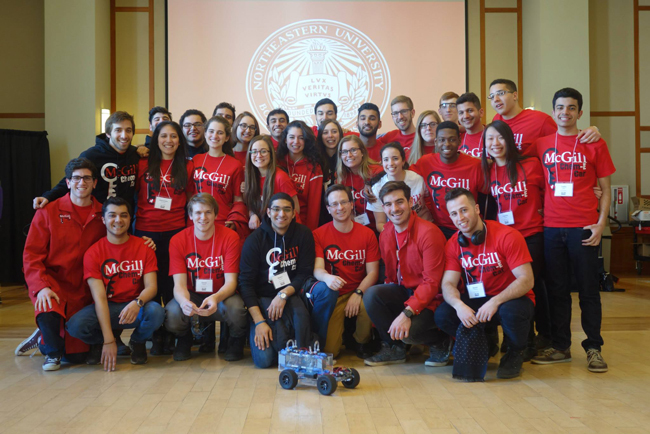 After a stellar performance at the AIChE Northeastern Student Regional Competition in Boston earlier this month, McGill's Chem-E Car qualified for the North American finals in Salt Lake City, Utah. McGill’s Chem-E Car team pose with their creation, Navona, following their second-place finish in the regional finals in Boston on March 8. In 1959, 300-pound Blues legend Willie Dixon penned the famous lyrics “I’m built for comfort / I ain’t built for speed.” Tipping the scales at a mere three kilograms, McGill’s Chem-E Car, which finished second at the AIChE Northeastern Student Regional Competition in Boston earlier this month, eschews both speed and comfort in lieu of a very different quality. The Chem-E Car competition is an undergraduate design competition hosted by the American Institute of Chemical Engineers (AIChE) in which teams of engineers from universities from across North America design and build small cars powered and stopped exclusively by chemical reactions. The primary objective of the competition is performance – each car must carry a weight between 0 and 500 grams over a precise distance between 15 and 30 meters. The distance and weight are announced an hour before the start of the competition. And design the McGill team has been doing. As per the competition rules, the McGill car, called Navona after the team’s main sponsor, Pizza Navona (Big Willie Dixon would have been proud), is small enough to fit in a shoebox and is made of less than $2,000 worth of materials. Navona is powered by a soluble lead flow battery that uses lead-based chemistry to generate a voltage between two electrodes. One battery cell is composed of a cylindrical graphite electrode that is surrounded by a hollow stainless steel electrode (essentially a small pipe) and the electrolyte solution is contained within. Navona employs seven of those cells arranged in a fashion that adds their voltages. The stopping mechanism is a color-changing reaction in which a solution switches from clear to dark blue after a certain amount of time depending on the initial concentration of one of the chemicals (potassium iodate). The time at which the color change occurs can be related to the distance that the car travels. A colour sensor detects the change and cuts power to the motor. At the Boston competition, Navona was tasked with carrying 500 millilitres of water over 16 metres, getting to within one metre of the target destination. The winning car, from Cornell University, finished 0.4 metres in front of the line. Not only was the second-place finish in Boston a huge step forward from last year’s sixth place finish in the team’s inaugural season, it also qualified them for the national finals (which encompass teams from all of North America) to be held in Salt Lake City, Utah in November. Visit the team’s website to learn more about McGill’s Chem-E Car visit the team’s website or follow its Facebook page.